Maison Nicolas Perrin is a collaboration between Nicolas Jaboulet and the Perrin Family. If the Perrin name sounds familiar, it should, as they own the most famous estate in Chateauneuf du Pape, Beaucastel. The idea for the wildly successful venture is due to Marc Perrin and Nicolas Jaboulet, which is where the name comes from. The idea came together after the Jaboulet family sold their vast holdings in 2006 to the Frey family, who also own La Lagune in Bordeaux. The headquarters is situated in Tournon, and as you might expect, provides a dramatic view of the Hill of Hermitage. The joint venture started out life with the plan to produce and sell their wine under the name of Jaboulet, Perrin Freres. That name was shelved once they discovered it was a problem to use the name Jaboulet on the label. The enterprising duo easily changed the name of their winery to Maison Nicolas Perrin. The responsibilities for Maison Nicolas Perrin are equally divided between the families. Much of the winemaking is being handled by Nicolas Jaboulet, while the blending and then bottling is being taken care of by Marc Perrin. The first releases from Maison Nicolas Perrin began with the 2007 vintage. They are focused on wines from the Northern Rhone with wines from Cote Rotie, Hermitage, St. Joseph, Crozes Hermitage, Cornas and Condrieu. Maison Nicolas Perrin makes 1 Cote Rotie wine. Maison Nicolas Perrin Cote Rotie – At this early stage, Maison Nicolas Perrin purchases wine from a select group of growers. Maison Nicolas Perrin provides the barrels and is responsible for the barrel aging, blending, bottling and sales of the wines. The bottling is handled in the Southern Rhone, with the hopes that the wines will be aged in the Northern Rhone, close to Hermitage. The blending of the various vineyard sources is the key to the success, quality and style of Nicolas Perrin Cote Rotie. Marc Perrin, with his years of experience blending 13 different grape varieties to produce Beaucastel, is more than up to the task of blending from multiple terroirs. Although, it is a bit of a challenge and different skill set to blend the various terroirs, instead of grape varieties. Maison Nicolas Perrin Cote Rotie comes from Syrah planted on both, Cote Blonde and Cote Brune, with a dash of Viognier in the blend for good measure. The Cote Brune grapes come from the Les Grandes Places vineyard. The fruit from Cote Blonde is planted in the Tartaras lieu-dit. The Syrah and Viognier are co-fermented. The wines are aged in a combination of new and used, French oak barrels for up to 15 months. The production is quite small, with slightly more than 500 cases produced each vintage. Maison Nicolas Perrin, when young, should be decanted at least 1-2 hours, give or take, allowing the wines to soften and open their perfume. Older vintages might need very little decanting, just enough to remove the sediment. 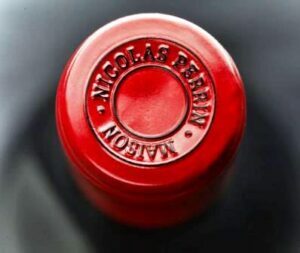 Maison Nicolas Perrin is often better with 5-7 years of cellaring and should be at its best between 8-15 years of age. Maison Nicolas Perrin is best served at 15.5 degrees Celsius, 60 degrees Fahrenheit. The cool, almost cellar temperature gives the wine more freshness and lift. Maison Nicolas Perrin is best served with all types of classic meat dishes, veal, pork, beef, lamb, duck, game, roast chicken, roasted, braised and grilled dishes, tomatoes, eggplant and sausage. Maison Nicolas Perrin is also good with Asian dishes, hearty fish courses like tuna, mushrooms and pasta. Condrieu, the white wine of Nicolas Perrin is best served with a myriad of different seafood dishes, shellfish, crab, lobster, sushi, sashimi, chicken, pork and veal, as well as Asian cuisine. The initial offerings from Maison Nicolas Perrin in total were about 2,500 cases in total. It is expected to ramp up to close to 7,500 cases per vintage before long. Fresh, lively, medium bodied, with bright red fruits with a hint of floral aromatics. The wine is elegant, bright and crisp with a sweet, black raspberry finish. The wine was made from a blend of 96% Syrah and 4% Vioginer and aged in mostly used French oak barrels, only 10% were new. There is an easy, likable charm to this wine, which is not common for a young Hermitage. The wine is smoky, fresh, clean, pure and shows ripe, spicy, dark red fruits, with stone and polished tannic feel to the finish. On the floral side of the style range, with fresh, vibrant, sweet, black raspberries, peppery cherries and just a hint of smoke and thyme. The fruit displays a good sense of purity and freshness in the soft textured, peppery finish. This is a nice wine and a fair value for Cote Rotie, which is an increasingly expensive region to buy wine from. The bottle was decanted about 2 hours before we started tasting it and it made a perfect match with the grilled pork chops. Far too young, 2 hours in the decanter was barely enough to get the wine started. But as this was my first time tasting this wine, I was anxious to give it a spin. Tannic, concentrated and filled with peppery, blackberries, spicy black cherries, wet earth and just a bit of oak, this very young wine had a lot of freshness and the structure to age. I'd give it a decade before popping a bottle, if I had any.